Years of slathering calamine lotion all over children…now to be told not to. So what does work? A warm bath with 2 cups of ground oatmeal (or if you don’t fancy getting your Jamie Oliver pestle and mortar out to grind your oats, there are a few oatmeal bath products out in supermarkets.) Take care as it makes the bath (and your sprog) super slippery. And as for Ibuprofen (more commonly known by the brand name Calprofen) there have been a small number of cases reported where children with chickenpox went on to have a very severe and life-threatening skin condition when taking Ibuprofen to lower their fever during chickenpox. The evidence isn’t 100% conclusive but on balance it is best to avoid using Ibuprofen whilst this is further looked into. So there you have it, short and sweet, week 3 done and dusted! For my full article on chickenpox, click here. 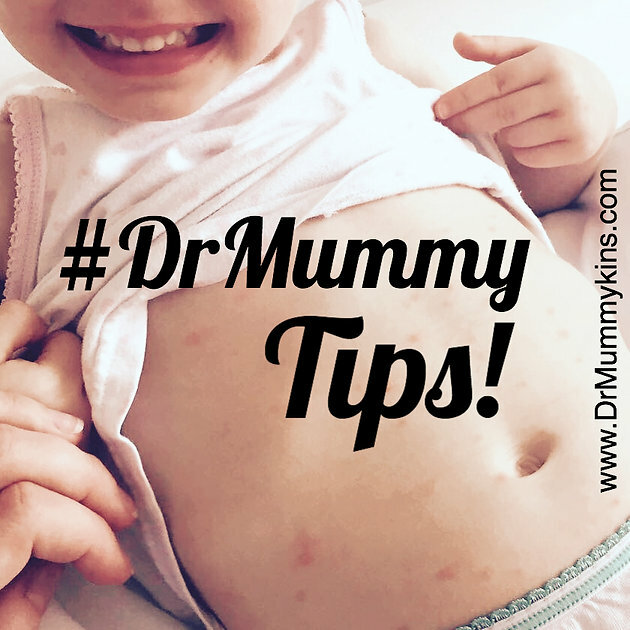 Follow me on Twitter @DrMummykins and using the #DrMummyTips hashtag, or on Facebook if you prefer.